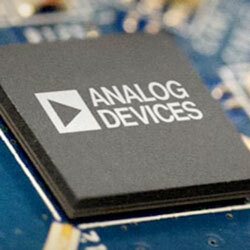 Analog Devices ADHV4702-1 HS Amplifiers provide a high voltage of 220V, in a unity-gain-stable precision package. The amplifiers provide high input impedance with low input bias current, low drift, low input offset voltage, and low noise, for precision-demanding applications. Next-generation architecture allows the device to run from symmetrical dual supplies of ±110V, asymmetrical dual supplies, or a single supply of 220V. The device is perfect for forcing a voltage in precision bias and control applications. Available in a 12-lead, 7mm x 7mm LFCSP with an EPAD, the amplifier is compliant to international electrotechnical commission (IEC) 61010-1 creepage and clearance standards. The copper EPAD offers a low thermal resistance path to improve heat dissipation. The EPAD also provides high voltage isolation, enabling it to be safely connected to a 0V ground plane despite VCC or VEE voltages. The device has an operational industrial temperature range of −40C to +85C. Typical applications include high-side current sensing, automated test equipment, high voltage drivers, piezo transducers, DAC, output buffers, LiDAR, APD, and SPAD biasing.